From crêpes to cake pops, waffles to candyfloss, there’s no end to the delightful desserts you can whip up in your very own kitchen with the proper kit — and as luck would have it, we’ve got that kit right here, in our round-up of the best home dessert makers. Perfect for parties, for a treat on the weekend or after a special dinner, these marvellous machines will make you feel like Willy Wonka, without the scary boat rides, or shelling out wages for the Oompa Loompas. There are brownies, and doughnuts, and waffles ready for the making — just keep your eyes peeled for a multi-purpose iron with interchangeable moulds that make the whole process foolproof. Then there are cake-pop makers, which produce impressive-looking little bites of heaven with minimal effort and often in as little as 10 minutes, perfect for buffet tables at birthday parties, or when they conveniently forget to tell you there’s a bake sale at school until 9pm the night before. For the connoisseurs of confection, there are expert-level waffle irons and home crêpe makers. If you have a near-constant hankering for batter-based goods, these are the machines for you, authentic appliances which are robust and long-lasting, easy to clean, and will work perfectly even in an accident-prone Sunday morning haze. It’s not all about the decadence, though. For everyday bliss, whether you’re following a low-fat or low-sugar diet, desperately trying to get more fruit into the kids before they contract scurvy, are avoiding dairy, or are just a big fruit fan, look for a machine that makes deceptively creamy desserts with just frozen fruit — yes, they exist! Whatever it is you're craving, a dessert maker can be a really valuable addition to your arsenal of kitchen gadgets, so keep reading for our round-up of the best. Pancakes, crêpes, blinis, even omelettes — no matter your flat-food fancy, it can be catered to with the powerful 1 kilowatt plate on the Breville Traditional Crepe Maker. It heats up rapidly to the temperature you set using one of the five clearly numbered options, and even heat distribution means no cold spots or uncooked bits. It’s considerable enough in size to make large, thin crêpes (and even comes with a traditional ‘t stick’ spreading tool and recipe booklet for maximum authenticity), but is easily stashed in the cupboard with its self-storing power cord. This is a perfect kitchen addition if you are looking for ways to bring the family together and spark creative new dessert ideas. This cake pop maker comes with a helpful booklet with recipes and decorating ideas, for making showstoppers even Mary Berry would be proud of. Its cheerful magenta casing stays cool to the touch while in operation and its non-stick plates release the perfectly formed little pops without fuss or mess. When you’re done, wrap them up in cellophane for a lovely addition to any party bag. The decorating possibilities with these cake pops are endless and you'll find yourself bringing this gadget out of the cupboard for parties, Halloween, Christmas and frankly any event that requires a speedy dessert. This is a great gift for aspiring bakers that won't break the bank. This oddly anthropomorphic-looking home dessert maker is a cute addition to any worktop, and keeps you feeling virtuous, too. All you have to do is add ingredients at the top and it turns frozen fruit into a delicious, substantial dessert in moments. It gives the effect of soft-serve ice cream with none of the lurking preservatives, added sugars, or — good news for the long-suffering lactose intolerant diner — dairy content. For that Mr Whippy effect without the guilt (or the astonishingly high rate of inflation), look no further. If you find yourself constantly looking for healthier dessert options and really don't like the idea of simply eating a piece of fruit, this is a great option to shake things up. Capture some of the culinary magic of mad-scientist-meets-food-genius Heston Blumenthal in your very own kitchen, all with the help of this professional-looking waffle iron. Smart in more ways than one (it also cuts a dashing figure in the kitchen) this worktop waffle maker automatically sets the correct cooking time for your waffles when you choose from Belgian, Classic, Chocolate or Buttermilk, and the wrap-around moat catches any excess to make clean-up a cinch. If Sunday breakfasts are a big deal in your house, and you fancy yourself a bit of a Heston, you need this. This 3-in-1 snack maker, with interchangeable options for waffles, brownies and mini doughnuts (incidentally “3 in 1” is also how we eat mini doughnuts) is a great tool to have in your culinary arsenal. Whether you’re making waffles for a big breakfast or perfectly gooey brownies for a coffee morning, the non-stick pans assure that your treats are easily retrieved intact, and the locking clip keeps curious little hands away from the hot iron. The cord also stores away in the body of the iron for easy storage. 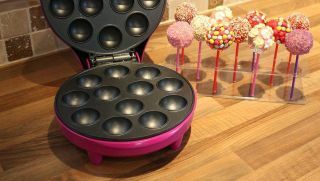 If you like the idea of the Gourmet Gadgetry Cake Pop Maker but worry it might be a one hit wonder, the VonShef 3-in-1 Waffle, Brownie & Mini Doughnut Snack Maker has more variety to offer. The smell, the taste, the texture: there’s a lot about candyfloss that’s hard to beat, and with a home candy floss maker, you’re not restricted to waiting until the circus rolls into town. This compact flosser is easy to assemble, disassemble, and clean after use, and its non-slip rubber feet keep things stable. It can be used with caster, granulated, or even flavoured sugar for a customisable candy treat, and comes with a measuring scoop for foolproof results. Terrible for your teeth, but great fun regardless.